These past many days have been sobering ones here in Toronto. In the aftermath of the inconceivable actions of one person that resulted in ten deaths and a number of seriously wounded victims, I felt the sense of “despair for the world” descend on my mood, a feeling I had all too often the years we lived in California and watched in horror the newscasts that too frequently often began with another school shooting or some other act of violence. Returning here, to a city I love, offered a respite from those all too common events, a chance to regain my footing. And then, tragedy struck here: a van attack by a troubled young man–and Toronto was in shock with the stark reminder that, in today’s world, no place is immune to these senseless acts of violence and the loss of innocent human lives. Where does one find the kind of peace that Berry describes? In our over-developed, crowded cities, where life seems to be defined by constant motion and noise, how can we reclaim the sense of peace, of gratitude for the world, so necessary for the human spirit to heal? These past many days, I’ve followed this city’s response to a violent and unimaginable tragedy. I’ve been touched by the way in which people came together to offer support and solace to one another and the families and victims of this tragedy. Last night, thousands of citizens, national, provincial, and religious leaders of all faiths walked together along the route of the attack before joining in a vigil to honor and remember the victims of the attack. Many expressed that coming together was not only a way to remember those lives lost in the tragedy, it was also a way to begin, somehow, to come to terms with the shock, grief, and loss, to begin to heal and find a sense of peace, to heal. One person put it this way: “I come because this is, I guess, a part of the healing process. I was here on the day of the accident, and now to get rid of those images, and to overcome those images, I believe this is the best way.” Interspersed throughout the vigil were times of remembrance, prayer, silence and stillness–the necessary ingredients to begin the healing process, find peace and some sense of gratitude for the world. Perhaps our increasing societal numbness to what former President Obama named as “routine” violence in the U.S. and so many other places in the world, is, in part, a result of the constant motion and noise that fill our daily lives. We race from meeting to meeting, social event to social event, respond to dozens of emails and texts each day, spend hours in front of screens when we’re alone. There, we’re assaulted by constant over-stimulation: news, trivia, games, retail offerings, advertisements, on and on. “A big luxury for so many people today,” Iyer says, “ is a little blank space in the calendar where you collect yourself.” That’s giving ourselves time for stillness, the opportunity to be quiet and allow us to care for our inner lives, and to feed our malnourished spirits. Think about it. It’s not unlike the “noise” in your head as you navigate the rush of information and appointments when given a diagnosis of cancer or other serious or life threatening illness. You feel overwhelmed and exhausted, yet you keep trying to navigate between opinions and the best decision for your treatment options. It’s quite common that, for a while, the physicians’ voice temporarily becomes your own. You need to give yourself some time to ponder and let things sink in without the clamor of medical opinions or the concerns of loved ones. Only then can you regain the ability to listen to yourself and your heart. Only in stillness can you find your voice, the clarity of what matters most and is important to you here and now. How do you find your voice? Giving yourself times to be still, quiet, and in the moment, can help. Cancer, or any chronic illness, as Dr. Paul Brenner, MD states, “is Life: You hope it can get better but fear it will get worse. There is no choice other than to live into what is happening now.” Those with cancer, he notes, live in the truth of the moment because that is all that exists. Living in what is ultimately is being present to the now, not living with regret for the past nor worrying what the future holds. It’s not always easy, nor does it come naturally. We have to learn to be comfortable with stillness, with the quiet and solitary time so necessary to having a sense of peace. Stillness, the time to be fully present in the moment, can help us clear away the static, clarify and discover what is truly important. Prayer, meditation, yoga, tai chi, a solitary walk along a wooden trail, an ocean beach–these are things that can help ground us in the present, the here and now and quiet. As Iyer reminds us, stillness–learning to be in the moment—isn’t about turning your back on the world; it’s about stepping away now and then so that you can see the world more clearly and love it more deeply. I have come to believe that stillness is an important part of what helps us heal, whether we live with loss, cancer, or other chronic illness. During a 2004 PBS interview former poet laureate, Ted Kooser, spoke about his recovery from oral cancer in 1968. During the period when I was in surgery and going through radiation, I really didn’t do any writing. But as I came up out of radiation and was trying to get myself back in some sort of physical shape, I would walk a couple of miles every morning and then find something along that route to write about…It was very important for me to see something from each day that I could do something with and find some order in, because I was surrounded by medical chaos or health chaos of some kind. It is a practice I have embraced in the past many years, one that always helps me right myself and remember what is good and important in the world. I have come to cherish stillness as life seems to be more complex. Perhaps you have discovered the power of it too. For this week, consider how quiet and stillness have been part of your healing process. When did you discover the value of stillness? What happened in your life at that time? 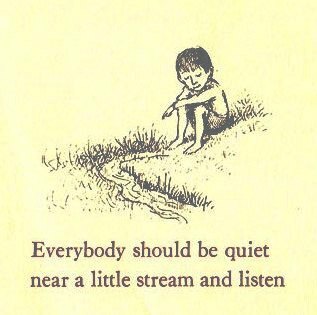 What practices have helped you learn to embrace quiet and turn your attention to what is, instead of what was or could be? The older…the more I mature, the more I realize the importance of quiet time in my life. I live with someone now and often miss the serenity of living alone. I try to schedule time away when he’s home to give him time to himself. Sometimes I think I may be odd, but was reassured by your post.